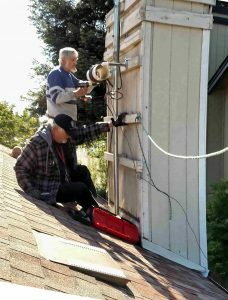 Norm WB6RVR (seated) helps with Bob K6DGQ’s Antenna repair. Our very dear member, Norm WB6RVR passed away suddenly 6-19-2017. Norm was a very big part of our club and the Ham Community. Norm helped all those who were in need of his assistance, regardless of how well he may have known a person. He was always there to offer a hand when it came to Antenna Setups, repairs, or even offering to help his clubs out financially with different tasks that they may have required. Norm was also a great help to the Ham Community in that he was there fighting along with a small group of people for all of our rights as California Amateur Radio operators. Norm helped to write, and have a law corrected that placed serious restrictions on HAMs by our CA law makers. Norm was instrumental in correcting a law set forth in January of this year 2017 barring all use of hand held or Microphone operated communications radios while traveling in a vehicle. It was Norm and his group who worked so diligently to correct that law to once again exclude the use of Amateur Radio within that law. Although not completely re-written as he would have like to see it, Norm was there continuing his fight up until his passing. Norm will be greatly missed by this club, and many others.